It can be a bit hard to find English folk traditions these days. As elsewhere, they have come under the assault of modernity, particularly powerful in a country that has done much to pioneer modern pop and rock music. Tradition can seem a bit, well, embarrassing, but being embarrassed about things is one of the more enduring English traditions, so we’re pretty good at it. There’s still plenty of tradition in public life in the form of ceremonial – Trooping the Colour, Black Rod at the ceremonial opening of Parliament and so on, but here we’re thinking of less exalted things. Fortunately, it’s there to be had if you look, because it also turns out we’re pretty good at keeping worthwhile old things going, when we put our minds to it. In truth, some of our folk traditions are conscious revivals, often based on diligent efforts to record the genuine living article before it died out. This was particularly a feature of the nineteenth century folklorists and collectors, and part and parcel of the same aesthetic that produced the Arts and Crafts Movement in the same period. By no coincidence, some of these collectors of half-forgotten songs or hoarders of musical instruments were the same people who trudged fields and moors searching out archaeological sites and making pilgrimages to ancient ruins. Now, after another spurt of support and revival in the face of brutal modernisation in the 1960s, you can find traditional folk sung in pubs, and ancient dances at county fairs or other public gatherings, albeit more in the country than cities. There are a variety of surviving forms of English traditional music, some very old – the well-known Greensleeves certainly goes back to 1580, for example – and many of these can still be heard in performances, often accompanied by specialist in now-archaic instruments (like the pipe and tabor) at festivals or heritage occasions round the country. More likely, you’ll encounter some form of English folk music. There was a period where this was truly in the doldrums, with the singer a parodic image, finger in one ear (though there are reasons for that), generally wailing. That would be an unfair picture now, though, of what is a healthy living tradition, where new compositions mix with variations (probably never the same twice) on traditional tunes. Many of the latter were collected in the nineteenth century, though then the bleaker – and often much ruder – versions tended to lose out when published to rather sanitised Victorian genteel variants. Some of these are still well-known, Scarborough Fair perhaps more than any, its English version recognisable from the more-famous imitation but considerably more melancholy. Probably the best place to hear this is at a pub on a winter’s evening with a good pint or several to hand. For the true experience, not a mere open mic night, you’ll need to find a genuine Local pub with proper hand-drawn beer and maybe a jacket potato, and a convivially appreciative crowd. A lot of this folk tradition has a strong regional bias through the dialect of the singing, the instruments or the location, and some songs are intimately connected with their birthplace, whether a county for Yorkshire brass bands or, for Newcastle and the ebullient Blaydon Races, even a single city. For anyone from the north-east, When the Boat Comes In, has a resonance, but a lot of it fairly incomprehensible to someone down south. Likewise, the Northumbrian pipes – a form of bagpipe, but sounding quite different to the more famous Scottish variant, played with a squeezebox, not blown and with a distinctive almost electronic sound, have strong local roots, and you may be lucky enough to hear them. Festivals, processions and dances were a key feature of English life, often accompanied by outlandishly dressed characters or hobby-horses. Some very ancient ones survive today, like the 12ft-high Salisbury Giant, a mediaeval survival still in use in the nineteenth century, but now to be seen in the city’s fine museum. Some old festivals are both well-known and in rude health – the Guy Fawkes festival (or Bonfire Night) being perhaps the most famous. Standing even in a village on that evening, you’ll see the distant sparks of celebrations at every point of the compass; flying in to London on November 5th itself can be quite a spectacle (the town of Lewes in Sussex also has a local variant which is worth seeking out). At most county fairs or village fetes you’ve a fair chance of encountering a maypole, or morris dancers, accompanied by the jungle of bells and the clack of sticks. Sword dancing is a bit rarer, and impressive. A lot of these traditional forms have a slight – or severe – whiff of danger to them. As a result some, like the infamous shin-kicking competition of the Cotswold Olympicks or the profoundly English and pleasingly baffling-and-terrifying cheese rolling competition at Cooper’s Hill in Gloucestershire have suffered a little in a more health-and-safety driven world. Still, traditions like Hallaton’s bottle-kicking or Sedgefield’s mob football, seem to be safe enough. Less dangerous, except perhaps to the face or comprehension muscles, are such English specialities as gurning (think of it as making-a-face as an extreme sport) or the Whittlesea Straw Bear, which is a little like Hallowe’en in some ways in that it involves a lad dressing up completely in straw for the day and going house-to-house demonstrating his dancing abilities in return for money, food or beer (which possibly started the thing in the first place). Many of these are of some antiquity; mummers – itinerant play-actors – go back to the thirteenth century; others, like Cheshire worm-charming (an exercise in encouraging worms to come to the surface of the ground), go back no more than a generation, but do demonstrate that the tradition of English eccentricity and joie de vivre is alive and (shin-)kicking. This was our second experience with Peter Sommer Travels, following directly on their Exploring Wessex tour. 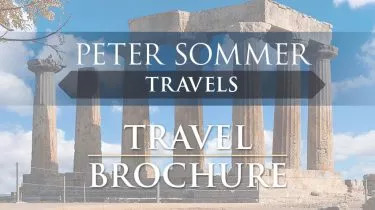 As with the Wessex tour, we are delighted to give Peter Sommer Travels an unqualified "excellent" rating on this tour. From initial contact, to booking, to superb coordination by the tour organizers, the excellent knowledge and wonderful humor of our guides, and the selection of tour sites, the trip was organized and run smoothly and with the interests and comfort of the participants always kept in mind. They are by far the best tour operator we have traveled with. Our Hadrian’s Wall tour was the inaugural run, and we are pleased to report it seemed like they had been doing it for years. The company must have taken great care in planning the itinerary, the lodging, the meals and the transportation so the participants would think it was a well traveled path. Peter Sommer acted as one of the guides and impressed everyone with his friendliness, attention to detail and amazing energy. He has assembled an amazing team, and we are delighted to give them all an unqualified "excellent" rating. Every one we worked with, from office staff to tour guides, exceeded expectations and helped make our trip memorable.